I almost always have to show you all my thrifty and vintage finds. Sometimes it takes me a while to use some of the items in my vignettes, but it just so happens that six of my recent finds combine in my latest fall vignette. My newest fall vignette is on the hutch of my desk. Remember the Enesco pheasant figurine that was made in Japan? It was in my last post about my finds. The Elgin wind up clock was the third clock in my new clock collection. The oval pheasant platter marked "Brooks Brothers" on the back was (I think) a giveaway from Brooks Brothers clothing. Of course there's a little fluff in there too to make look like a vignette, like the mini pumpkin, vintage oil lamps from my collection, a very fun old wooden box with pine cones and foliage. 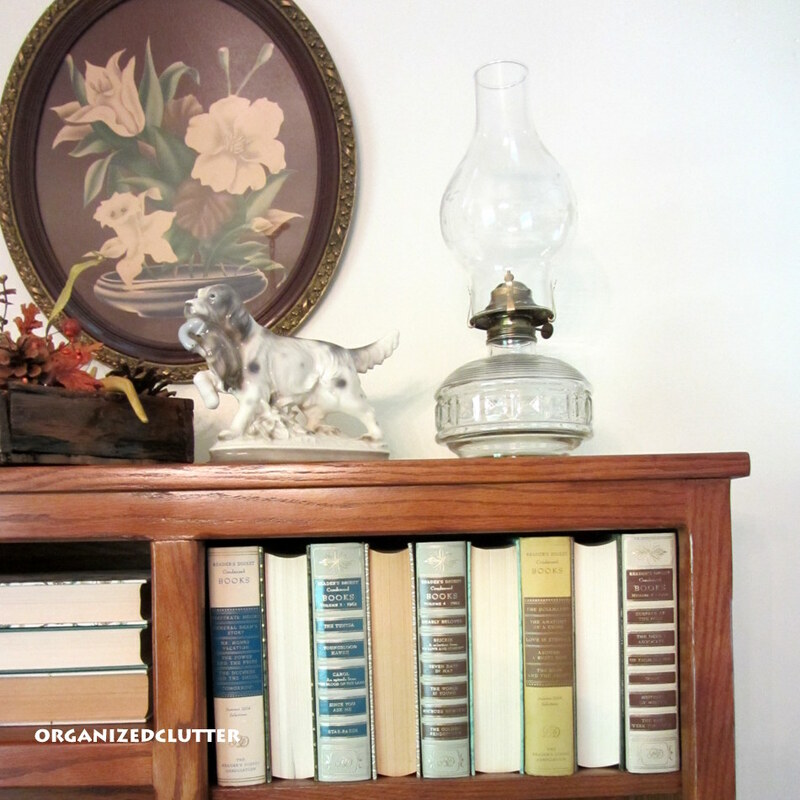 There are two more new finds on the lower hutch shelves for a total of six new finds used in this vignette. The Westclox square clock on the left and the black Baby Ben on the right were finds during the summer. I love decorating with collectibles! Carlene, your vignettes are always so interesting. You would love the auction that I attend on Mondays-a collector's heaven! Lovely vignette! Those are great finds!! Visiting from Stone Gable. Your pheasant figurine and platter were meant to be together. Love the fluff in your tool caddy, too! Carlene, Your vignette is really pretty. 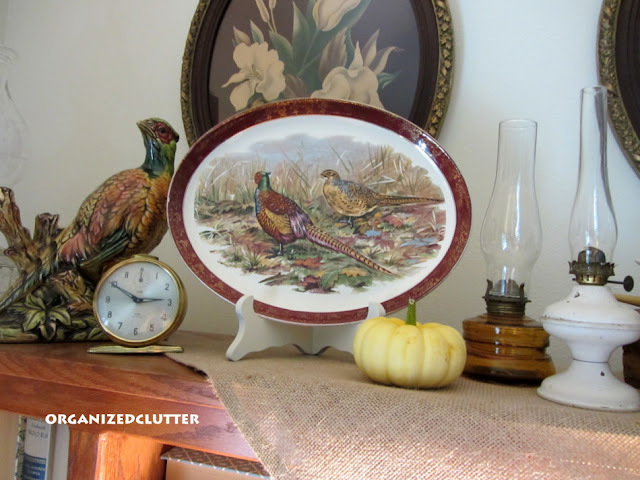 I love anything with pheasants and your BB tray and the pheasant figure are perfect for Fall. I remember the spaniel because I have one just like it. :) It's on my hutch part of the desk in the office, too. Pretty vignette! All the items compliment each other so nicely. I'm intrigued by how you placed the books...great idea! Great vignette. I love the pheasant. Everything goes together perfect, especially love the books!! 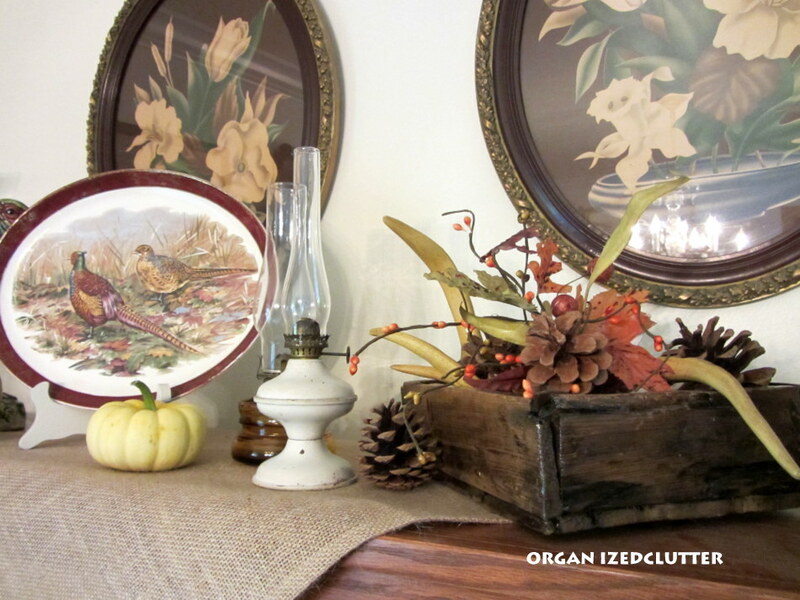 Love your vintage fall vignette! I love the dog figurines and the platter is great! So perfect with the pumpkins, etc. I have to get going on my mantle! Beautiful vignette Carlene. I love that you've used your awesome finds! 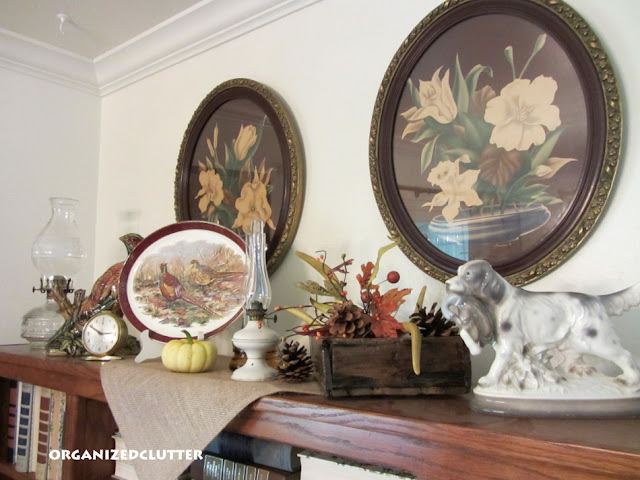 Carlene, Your fall vignette is lovely! I really like how you've used your vintage finds as focal points on the shelf. 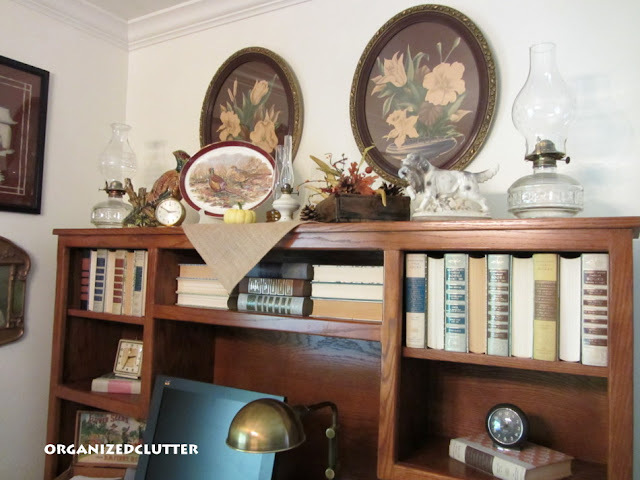 All of your treasures look wonderful in your vignette Carlene! I just love when everything comes together! Thank you for joining TTf this week. Have a fantastic weekend! Carlene, that is one beautiful vignette! I also want to say that that whole book case/shelf is gorgeous! I think my in-laws have a couple of those spaniels. I'm going to have to check it out closer when I'm there. Thanks for sharing! Love this Fall vignette Carlene. The pheasant worked in great with all of your collectables. Hi Carlene, this is such a beautiful Fall vignette. I just love your pheasant and dog figurines, the whole mix is warm and comforting "vintage"!! thanks so much for being a sweet friend and supporter!! What a lovely vignette!! Thank you for linking up at Feathered Nest Friday!